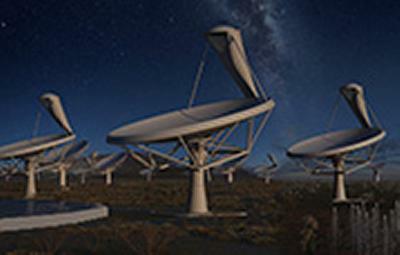 A scientist from the University of Southampton will be helping to design and build the world's largest telescope. Professor Anna Scaife, from the University’s Astronomy Group, will join other UK scientists, engineers and industries in supporting the design of the Square Kilometre Array (SKA), which will be the largest and most sensitive radio telescope in the world. Professor Scaife will lead the development of the Imaging Pipeline for the SKA as part of the Science Data Processor (SDP) work package consortium. She also has two post-doctoral research assistants, funded by the UK government, working on the project in Southampton, as well as leading a larger distributed team in the UK, South Africa, Australia and New Zealand. Using a network of radio antennas around the world, SKA will advance radio astronomy in understanding how the Universe evolved and challenging Einstein’s theory of relativity. With receivers across Africa and Australia, its dishes and antennae will provide detailed information on the large scale 3D structure of the Universe. The SKA radio telescope project will produce around 20 times the current global traffic of the internet in its internal telecommunications system. In fact, to play back a single day’s worth of SKA data on an MP3 player would take two million years. The Science and Technology Facilities Council (STFC) will manage the UK role in the project, which will be at the forefront of astronomy over the coming decade. This week, STFC confirmed £19m funding over the next four years to support the design of the SKA project. In addition, the Science Minister David Willetts has announced further funding of £100m for the SKA project as it moves towards construction from 2017. Thanks to the investment being made in the design phase, British scientists and industry partners are already helping to develop the central computing and data handling systems, which will read and process the huge volume of new data, meaning this project could lead to faster smartphones and increased internet speeds across the UK in the future.